For the second year in a row the Loonstock Music Festival will hit Wetaskiwin. The August 17th one day concert boasts three of the best tribute bands in North America along with two talented local girls. Organizer Larry Moussa has stepped up to the plate once again after the inaugural Loonstock last year. Larry is hoping to build on last year’s festival which drew a lot of attention from the community. After all what could be better than a summer classic rock festival on a beautiful Loon’s Golf Course? This year’s lineup has three sought after bands that Larry worked six months to get. “These bands are booked solid year round and are hard to get. They are all very good musicians”. Eight hours of rock and roll will get you Hotel California (Eagles tribute), Green River Revival(CCR tribute), Evolution(Journey tribute) along with local girls Christina Dennehy and Megan Gregg. Emcee duties will be handled by Dean Pezderic. Each band will play for 1 ½ hours. 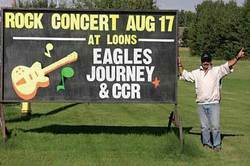 Last year’s Loonstock was competing against Big Valley Jamboree in Camrose on the same weekend. Larry was happy with last year’s event but made sure to avoid any competition this year around. As an added bonus festival tickets have been reduced for this year. The festival will have a VIP seating section, beer garden, and three full concessions with Bean’s, Dominoes and Food With Flair. Boston Pizza will cater to the bands. The stage will be positioned in a grove of trees facing into the field. The sound system “costs $7,000 for the day”. It sounds like this place is going to be rocking and rolling. This is a family event however, 11 and under get in free accompanied by an adult. Camping is available at Loon’s RV Park. Early bird ticket purchasers get a free round of golf. Well this all sounds pretty good. Just how did organizer Larry Moussa decide to get in the concert business? “I went to the James Theatre a couple years back to see a Led Zeppelin tribute and was blown away. Everybody loved it, and I always watched people going to Camrose. I thought I could do this myself”. It is obvious Larry is a music fan and “wants to create something for Wetaskiwin”. In the future he would like to include original bands. People like music and Wetaskiwin can definitely use an event like this. Good luck to Larry and anybody involved with this, we will see you there.